There is an esteemed group of companies on the ASX, such as CSL and Macquarie, where investors give management the benefit of the doubt. They trust that short-term issues can be overcome, and that future earnings guidance will not only be met, but may even be exceeded. Once upon a time, QBE Insurance belonged to this group. However due to a range of recurring issues stemming from acquisitions made prior to 2010, QBE’s results are now viewed by investors in the most critical of lights. Here we put the spotlight on today's result for Livewire's reporting series. For Atlas, the most important piece of information was the sale of QBE’s Latin American division to Zurich for US$409m at a price around twice tangible book value, a good result for shareholders. Aside from the price received, we were very pleased to see management recognise that this business was both sub-scale and that QBE had no competitive advantage in underwriting risk in these emerging markets. For a number of years, QBE’s Latin American business had been the source of downgrades from exotic insurance products such as Argentinean workers comp (2014), crop losses in Ecuador, and fraud in their Columbian third-party motor liability portfolio (2017). Removing this problematic division, that has both consumed shareholder capital and management attention whilst delivering minimal returns, looks like a case of addition by subtraction. QBE’s result was largely released to the market on the 23rd of January, when the company advised the market that it expected an after-tax loss of US$1.2 billion. This was primarily due to non-cash items such as the write-down of North American goodwill and a reduction in the US corporate tax rate that reduced the value of US tax credits on QBE’s balance sheet. Consequently, there were few surprises in the result other than the capital position discussed below. Looking across the detail of the result, ANZ and Europe continued to deliver solid results with the US and Asia disappointing. The US business’ result was impacted by catastrophe claims from Hurricanes Harvey, Irma and Maria as well as California wildfires, though this was offset by a positive impact from US crop insurance. Investment performance was a highlight, with the investing team delivering a 3.2% return in 2017 on QBE’s $26.1 billion portfolio, a creditable result for a portfolio dominated by low returning corporate and government bonds. However, this solid performance in 2017 does raise questions about size of the near-term upside for QBE from rising interest rates. Overall this result reinforces our view to be cautious towards QBE, though we applaud the new CEO’s decisive moves in exiting Latin America and plans to simplify the business. Whilst QBE will benefit from rising global interest rates, strengthening commercial premiums in the US, and a falling AUD, we would like to see some signs of a consistent turn-around in the quite complex North American business. The last year in which QBE’s North American business showed solid profitability was in 2011! 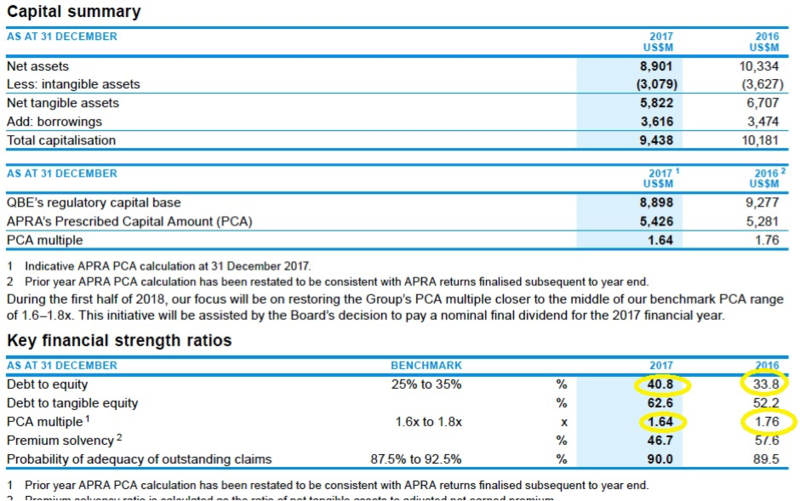 If investors use the low end of QBE’s guidance for both the combined operating ratio and investment return, QBE would be trading on a PE of 12.7x with a dividend yield of 5%, attractive multiples compared with other companies on the ASX. Australia’s global insurer needs to demonstrate more consistency though before being given the benefit of the doubt by investors. What is the market missing about this company? Last February, QBE announced a buy-back of $1 billion over three years and at today’s result management re-iterated their commitment to the buy-back, providing investors with an incentive to own shares in the company. However, looking deeper at QBE’s balance sheet leads one to question the company’s capacity to conduct this buy-back. Additionally, a key capital ratio also deteriorated namely the Prescribed Capital Amount (PCA) finished at the bottom end of QBE’s target range. This measures the sum of the capital charges for asset risk, asset concentration risk, insurance concentration risk and operational risk as required by APRA. Against this background, we would not be surprised to see QBE drag their heels on buying back stock in 2018 due to capital constraints. Couldn't QBE used the proceeds from the Latin American division sale to do the buyback ? Personally as a QBE shareholder - I'd love to see management sell off the less profitable parts (ie. Asian and the North American business which they've spent years trying to turnaround) and return the capital to shareholders either through share buybacks or a special dividend. That way we get something back as shareholders and the stock will also be re-rated.